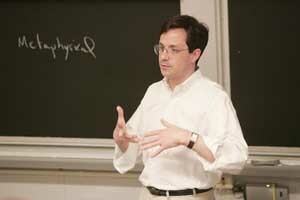 The first thing a visitor to Michael Green’s online journal, or Web log, (http://humanities.uchicago.edu/faculty/mgreen) might notice is the quality of the criticism—not of others, but of Green’s own ideas—which he posts along with interesting statements that arise in his classroom. As a result, his students become part of a discussion in a new way, and readers all across the world can see how they have contributed to an ongoing discourse. Green, an Assistant Professor in Philosophy and a member of the Human Rights Program, explained that though the Web log is just a technological tool, it reflects something essential. “I’m not the only one in the classroom who matters or who’s contributing. A class isn’t good if I just deliver an organized lecture full of interesting points. It’s only good if the students have gotten something out of it and are involved in learning. Ideally, it is an interaction that works on both sides rather than just one person delivering a talk. Green received his A.B. from the University of Michigan in 1989 and his Ph.D. from the University of California, Berkeley in 1997. He joined the Chicago faculty in 1999, and in 2002, he was awarded a Residential Faculty Fellowship at the Franke Institute for the Humanities. He focuses on ethics and political philosophy, having published and delivered papers on justice, nationalism, Thomas Hobbes and David Hume’s theory of personal identity.